Lithium Ion Battery powered - with wall charger. Works for both Formier (H2,N2) mixtures and Argon gases. Long life zirconia sensor, won't saturate in air. Portable instrument with rubber boot. Inert gas welding requires the exclusion of oxygen from the weld zone during the welding process. The shield gas ( typically argon ) needs to be free of oxygen from air leaks into the feed hose and the back side of the weld needs to be protected with a purge, or backing, gas to ensure a low or controlled oxygen concentration on the back face of the weld. On the front face of a weld the the inert gas stream (provided it is free of leaks ) efficiently excludes oxygen from the weld zone. On the back side of the weld special precautions must be taken to prevent oxidation. This involves the isolation of the back side of the weld with fixtures that provide for the purging of this area with an inert atmosphere. The OXY-SMART instrument works with these fixtures to continuously sample the purge gas and to monitor the oxygen concentration. Monitoring the weld gases with an OXY-Smart adds a quantifiable element of quality control to the inert gas welding process. The unit contains a small pump which draws a continuous sample from the purge gas in the welding zone. This sample is passed into a special zirconium detector that is very sensitive to the presence of oxygen. A zirconia sensor is an electrochemical oxygen concentration cell with a solid ceramic electrolyte. It has the property of producing a small emf (voltage) in the presence of oxygen. The relationship between the emf produced by the detector and the oxygen concentration is well understood and highly repeatable. This means that the detector can be calibrated directly in oxygen concentration units. Sensors of this type can be used to measure concentrations from a few ppm all the way up to 100% oxygen. 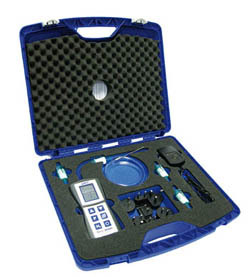 They are very reliable, the calibration is stable over long periods (years) and a detector calibrated for use with low ppm concentration as in the welding application will not saturate or show any degradation when exposed to high oxygen concentrations (air for example). 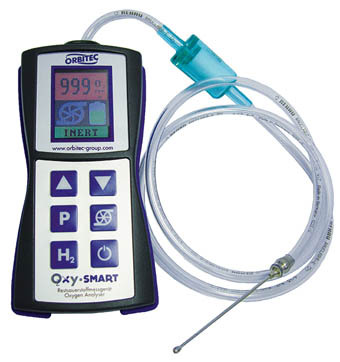 OXY-SMART Complete instrument includes: Controller with LED readout, built in sample pump, 10 ft. of connecting hose, gap probe and filter. Click the caliper to request an RMA.